Galen is the prince of the Syrena, sent to land to find a girl he’s heard can communicate with fish. Emma is on vacation at the beach. When she runs into Galen—literally, ouch!—both teens sense a connection. But it will take several encounters, including a deadly one with a shark, for Galen to be convinced of Emma’s gifts. Now, if he can only convince Emma that she holds the key to his kingdom . . .
1. Insta Love: Should I say more? If there were rallies and opposition groups for insta-love I would be one of the first people to sign up. No matter what genre the book I’m reading is, whether paranormal, dystopian, or fantasy, and no matter how out of the world the plot is, I STILL want a realistic love story. Insta-love is the most unrealistic love plot in the history of love plots. Best friends fall in love? Yes, girl gets the bad boy and reforms him? Yes, smitten at first sight? Yes, desperate, world shaking love at first sight? NO. I really hated how the two leads, Emma and Galen somehow became head over heels in love with barely any verbal communication happening! I’m sorry, I can’t get over that. 2. Adding many clichéd secondary characters: so, one supposedly important character in the novel gets KILLED in the second chapter. Not only was the character portrayed as important to the protagonist, the character was MEAN and just straight out rude to the protagonist. So I really felt no sympathy and no connection to the small grieving period Emma went through. Another two characters fell in the line of “Girl hates guy, guy chases after her, the minute the guy turns his attention to another girl, the girl realizes she LOVES HIM” REALLY? I feel like this wasn’t played well, all secondary plots were too shallow for me to invest or care enough on what happens, and the girl was a diva and the guy was just desperate, which is why I just didn’t care. 3. Forced plot: A couple of days ago I wrote a review about how the close proximity between the protagonist and her love interest was not forced, and I really don’t like how some novels force the characters together. Well, this happened in Of Poseidon. Emma’s mother thinks Emma is dating Galen so they go along with it, oh and to make it more believable they have to make out whenever they are in public! Why can’t authors think of original non-clichéd plots to allow their characters to spend time together? And no, accidently sleeping at his house more than once is NOT one of them! Now, there is one thing I liked about this novel, and it is the ending, the last 30 pages were definitely fast paced and the ending was SO unexpected and I have to give props to the great cliffhanger. However, that really is the only thing I liked about this book, and reading it was a very slow process that took around a week, and that is way too many days for a measly 300 page novel. I'm thinking of getting this one, but your review has me really worried, Juhina. Gah ! I hope I like it better than you did. Uh oh. :/ Can't say I'm surprised though. I'm pretty wary of this novel and now contemplating not even giving it a try even though I got an eARC too. It doesn't sound very original at all. Oh dear... :( So bummed you didn't like this one! I'm waiting for it to come in at the library. I'll still give it a try, but I'll be more wary. Thanks for your honest review! Oh no, I'm going to be reading this book soon. Will have to push through and see if I like this better but still, thanks for the heads up. ANyways, I did like some aspects of it but I'm glad to see I'm not the only one who wasn't that impressed. Oh dear. I know you don't rate books 1 star lightly so I guess this must have been awful for you! I don't know what to think of this book... People either love it or they don't. I guess I will just have to find out which side of the fence I am on myself. 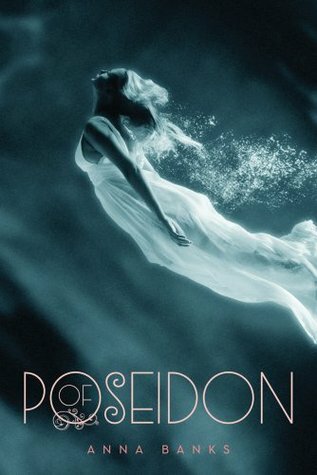 I really loved the setting of the book and getting to know the Syrena world bit by bit. I was extremely captivated by the Syrena. I loved knowing about the Royals, learning their customs and ways of life. I enjoyed being introduced to sifting and mating rituals and learning about the two powerful houses: Poseidon and Triton. I liked that Anna Banks added some background story, giving enough information to make everything clear, but still keeping readers in the dark by hiding essential details that will be revealed in the future books to come.